My first encounter with Moviola was over 11 years ago, when I procured a copy of the Frantic EP (on 10" vinyl no less) from Trader Vic's on a tip from Tim Taylor. He gave me the obligatory record clerk logic "If you like Pavement, you'll love these guys from Columbus." That was a spark indeed, a band only 60 miles away that tried to sound like my high school crush. Long gone are the days when Moviola cribbed from those lo-fi pioneers and dressed up their rustic pop in crusty fuzz and spindly guitars; 'cept for the nostalgic whiff that begins "Hand to Mouth." The quartet's seventh album, Dead Knowledge (on Catbird Records), is "matured" sure, but also the most adventurous, nuanced, and definitive album of their decade plus span, connecting the dots between Big Pink, the Grand Ole' Opry, Haight Asbury, Laurel Canyon, Muscle Shoals, and back to the Iuka Ravine. By genre-hopping through the annals of Americana, unearthing mothballed memories, local folklore, and instruments from the attic (or the Elida High School Marching Band), Dead Knowledge might resonate as the group's last waltz (sorry, had to say it); the album they've always wanted to make. Recorded among the dollar stacks at the fabled Used Kid's Records, it's a confident and original reflection/mosaic of the heroes (Levon Helm, Neil Young, Bob Dylan) that were staring at their backs from musty, tattered covers. Rather than shunning off influences, Moviola embrace them here, feeding off the spirits that rose from the vinyl graveyard. 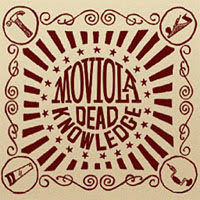 Moviola's longevity though, predicts Dead Knowledge is a new awakening, most evident in the rough-hewn, almost lysergic and definitely slow-burning, psychedelia that creeps into the album's first third. "Akron to Oakland" and "Rudy" recall American Beauty-era Grateful Dead, not the hirsute, brown acid, ten-minute jam, you're thinking of, but the adherence to craft and tradition a spry Jerry Garcia twisted into breezy, and equally trippy, little labyrinths. Elsewhere there are hints of bluegrass, "Humility," Tijuana brass, "Knotty Pine," and smoky, juke-joint blues, "Don't I Know," all along the way lined with weeping slide guitars, elegant strings, the occasional Beach Boys harmony, and some of the crunch from their roots for good measure, making for one varied and quite delightful travelogue. Beach Talk - The Tree of Snakes Finale?